Remain open minded. Staying open minded is often difficult when you're trying to get a job done. But it's important to remember that "one man's junk is another man's treasure." In other words, don't be eager to discard your elderly relative's beloved items or to brush aside their concerns. Make time to provide a moment of gentle reassurance and to consider the feelings of your loved ones. Only take what is truly necessary. 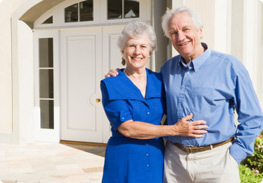 Senior relocation is often a result of necessity rather than desire to make a dramatic life change. If your senior relative is downsizing, he probably won't be able to take everything he owns. Still, he should be able to determine which items are important and which are extraneous. If you're unable to help directly, hire an experienced senior relocation service that has familiarity with what items are needed in a small apartment, in an assisted living facility or in a nursing home. In fact, you may want to consult with an expert even if you're planning on packing up yourself so that you'll have a better understanding of what to pack and what to toss. Avoid messy packing products. While your children may enjoy the excitement of packing peanuts and large boxes with treasures inside, your elderly relative probably won't appreciate that part of the experience. To simplify the senior moving experience, avoid messy packing materials such as peanuts or shredded paper, and opt for tidier options such as bubble wrap or air cushions. Pack in small boxes. It may be slightly more difficult to use smaller boxes instead of larger ones, but doing so will make it easier for your elderly relatives to assist in the moving process. Not only are smaller boxes (generally) easier to carry, but they are easier for seniors to unpack without getting fatigued. If you'll be packing independently, you may want to check out this guide to practical packing for additional tips on packing successfully. Look ahead. If you're thinking that the senior moving experience is focused around the actual move, you are overlooking the most important aspect of the experience – the final outcome. Most elderly people aren't as concerned with the details of the move (since they can outsource this manual labor) – they are concerned about what they will encounter upon arrival. Make your elderly relative feel comfortable with the move by taking pictures of the new place, going to visit (if possible) and even getting a floor plan of the senior's new living environment so that you'll know definitively which furniture should be taken and which should be left behind. Make sure to answer all questions about the senior's new residence so that your loved one will approach the move with anticipation instead of anxiety. Remain in contact. One of the hardest parts of the senior moving experience is the sense of abandonment or disregard that the senior may feel after he has settled down. Even if you're moving a parent to a residence that is closer to your own, your parent may feel as though he didn't have a choice or voice in the process. If your parent or relative is moving further away, these feelings can be greatly magnified. The best way to overcome this obstacle is to remain in contact with your elderly relative so that he feels loved and respected at all times during the process. This may require a few minutes of your time on a regular basis, but you'll be contributing greatly to the comfort of your elderly relative. Senior relocation is a process that is both physically and emotionally exhausting. Nevertheless, with the right mindset and preparations, the process can be exceptionally rewarding for both you and your elderly relative. Make time to prepare yourself (and your relative) for this transition – you'll see what a difference these preparations can make!